The Orbital Shaker 100 features a microprocessor-based keypad with digital display of preset time, continuous run, and RPM indicator. It also offers aluminum construction, painted with a silicone-based enamel, as well as a 12-in by 12-in platform constructed of black anodized aluminum and covered in skid-free rubber sheeting. The product has a load capacity of 20 lb and continually variable speed up to 150 RPM. The hermetically sealed motor ensures quiet and trouble-free operation in either an incubator or cold room environment. 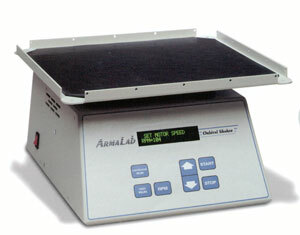 The shaker also features a heated platform with temperature controls in the Hot model. ArmaLab, LLC, PO Box 1601 Bethesda, MD 20827-1601. Tel: 877-ARMALAB; Fax: 301-340-0582.